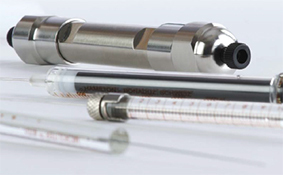 Hamilton Company has been developing and manufacturing pressure-stable polymeric high performance liquid chromatography (HPLC) columns for nearly 35 years. 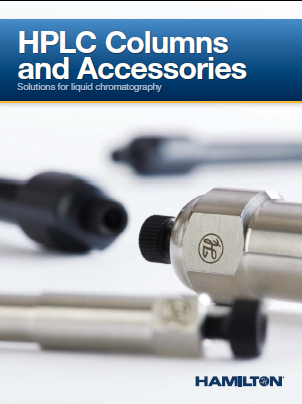 Hamilton Company offers a full line of off-the-shelf and custom chromatography products for HPLC, gas chromatography (GC) and thin layer chromatography (TLC). 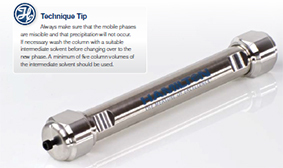 Hamilton offers an extensive line of off-the-shelf HPLC columns with different packing material chemistries, varying particle sizes and column hardware dimensions in two hardware types—stainless steel and polyether ether ketone (PEEK) plastic. However, even with all the standard options available, customers often require a custom built column where they may need one of our stationary phases packed into a column hardware combination that is not a standard product. Routinely monitor the column’s performance. Switch only between mutually miscible mobile phases. Avoid the possibility of precipitation of salts in the column. Use only filtered and degassed mobile phases. Do not allow the column to dry out. Keep the column capped with the end plugs that came with the column when not in use. For prolonged storage, use a mobile phase that will inhibit bacterial and mold growth. Unusually high operating pressure is an indication of a plugged inlet frit. It may be cleared by reversing flow through the column for 5–10 column volumes. 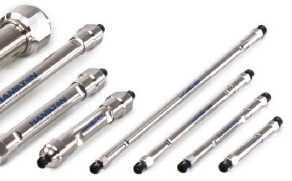 Using guard columns is highly recommended to remove particulate matter or impurities which may permanently bind to the polymer packing materials inside the analytical column.